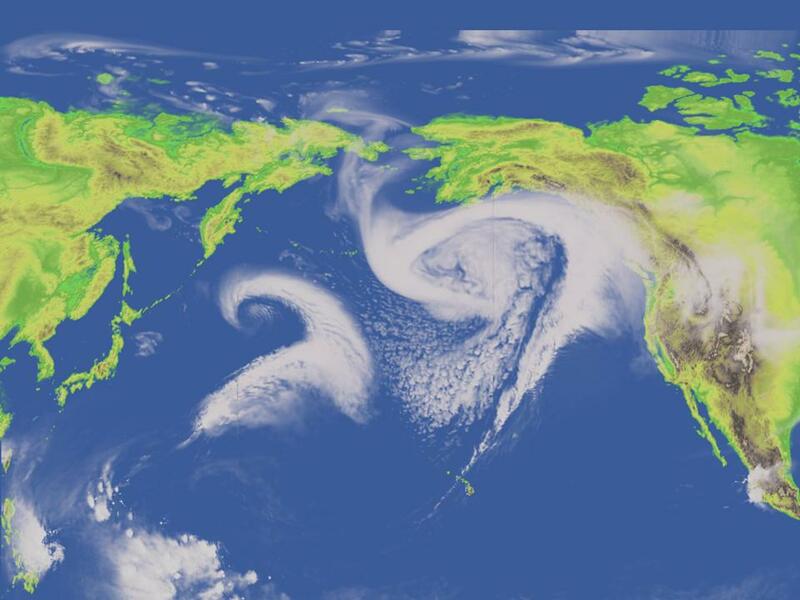 The Pacific storm track, seen here in a simulation by NOAA, affects weather and climate around the world. Image courtesy of Geophysical Fluid Dynamics Laboratory. RICHLAND, Wash. — The first study that combines different scales — cloud-sized and earth-sized — in one model to simulate the effects of Asian pollution on the Pacific storm track shows that Asian pollution can influence weather over much of the world. The results show that using multiple scales in one model greatly improves the accuracy of climate simulations. Minghuai Wang and Steven Ghan from Pacific Northwest National Laboratory joined researchers at Texas A&M University, the University of California at San Diego and NASA's Jet Propulsion Laboratory, to report the work in the Proceedings of the National Academy of Sciences (PNAS) Early Edition online April 14. Atmospheric aerosols such as pollution can affect the climate by altering cloud formations. But many studies rely on global climate models that lack the resolution to pick out the fine detail in clouds. Global climate models paint the Earth using pixels about 200 kilometers on a side — whole clouds could fit inside one of these pixels with room to spare. Wang and Ghan used a computer model with pixels 4 kilometers on a side. Clouds stretch out over many pixels in this model and provide much finer detail. Then the team embedded the high resolution model within the low resolution global model where it could run separately but interact with the global model. "The higher resolution improved the cloud simulations," said Minghuai Wang. "Conventional global scale models usually show a decrease in precipitation in response to man-made aerosols, but we see the increase that we know happens in real life." Read the entire release from Texas A&M University here. Reference: Yuan Wang, Minghuai Wang, Renyi Zhanga, Steven J. Ghan, Yun Lin, Jiaxi Hu, Bowen Pan, Misti Levy, Jonathan H. Jiangb, and Mario J. Molina. Assessing the effects of anthropogenic aerosols on Pacific storm track using a multiscale global climate model, Proc Natl Acad Sci U S A, Early Edition online the week of April 14-18, 2014, DOI:10.1073/pnas.1403364111.